It’s no secret that kids can be picky when it comes time for meals. Getting them to not just eat, but also enjoy healthy, nutritious food can be a struggle for a lot of parents, but it’s also incredibly important. Which is why protein-rich, healthy foods that are also tasty and versatile are key. 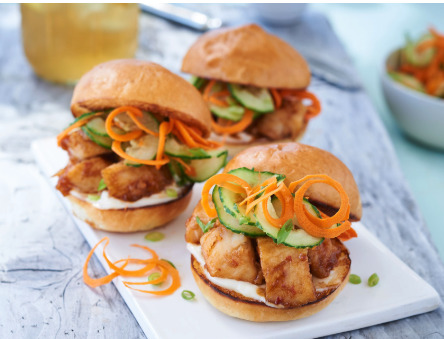 Enter wild Alaska pollock, the optimal family-friendly fish that — thanks to its super mild flavor — even your kids will love. From recipe testing and menu planning to dinner parties and kid-approved dishes, wild Alaska pollock is a fool-proof crowd pleaser, and it also happens to be packed with all of the nutrients you want and none that you don’t: it is high in protein, low in fat, high in Omega-3 fatty acids, high in B vitamins and can help lower cholesterol and blood pressure. It really does check all of the boxes in terms of picking the healthiest and best foods for your family. Wild Alaska pollock is a great go-to fish because in addition to the health benefits, the flavor benefits are equally enticing. This species is incredibly mild, but not bland or boring. It’s often been compared to cod, which makes sense because it is a member of the cod family. It is low in oil content, has white flesh, an approachable flavor, and flakes beautifully when it is cooked. Both the texture and the mild flavor make wild Alaska pollock an extremely versatile fish to work with. It can be broiled, baked, poached, sautéed steamed and fried. It’s the type of fish that takes on the flavors of the seasoning and accompaniments you choose, so as long as you work with a recipe and other ingredients that your kids will like, you can feel fairly confident that they will devour their new favorite fish. Nothing says FUN like a trayful of sliders, which pack the perfect punch of flavor, texture and nutrition. And sneak in those veggie — lettuce, tomatoes, avocado, pickles — between hearty multigrain buns. We’ve yet to meet a kid who doesn’t love a fish finger or a nugget, and you can keep them healthy by crusting your wild Alaska pollock chunks with coconut flakes or gluten-free bread-crumbs. Pasta is comfort food, no matter your age. And because of wild Alaska’s mild flavor, you can pretty much flake it — for that extra jolt of protein — and work it into any type of pasta dish you like. Stir-frys are the perfect last-minute meal to pull together, and also a great way to feed veggies to your kids. With the help of teriyaki and soy sauce, for example, you can create all varieties of delicious combos that are nutrient-dense, without skimping on flavor. Taco Tuesday (or Monday, or Wednesday, or Thursday or any day really!) is always a favorite, not only because of how delicious fish tacos are, but also because they engender the whole build-your-own, interactive quality of eating that quickly takes a family meal from good to great! Your favorite grain or rice, a little egg, some soy sauce, chopped carrots, scallions and peas, and of course wild Alaska pollock, will literally take a bowl of cozy fried rice to the next level of taste and nutrition.